Samantha Locke ’22 told me she worked out her entire D-Plan during orientation week, complete with possible course listings, major requirements, a Foreign Study Program and even an exchange term at another university. Locke doesn’t think of herself as a serial planner; she just wants to make the most of her time. Her dream is to be a prolific writer. Someday, Locke hopes to be the lead writer on her own show. After that, she’ll write novels, poetry and children’s books. So why is she majoring in physics? Like Locke, Benjamin Brody ’22 isn’t on the path he imagined — but in the opposite way. He thought he would switch majors — but didn’t. Brody’s love of classics has been reaffirmed, and he hopes to teach it in the future — but that isn’t all he wants to do. In high school, Brody felt like he was too entrenched in his routine: schoolwork and hockey. Coming into college, he wanted to bring this bounce-around attitude into his extracurricular life as well. “I don’t like getting caught too much in one community, one group, one routine,” Brody said. But he’s surprised himself by finding spaces he wants to be in more permanently. The communities Brody has become a part of are not the ones he expected. He thought he was tired of hockey after high school, but after being roped into going to tryouts, it’s become one of his favorite activities. He thought he’d be in pre-professional clubs, but has instead built a sense of place in the Dartmouth Outing Club. Fulya Dal ’22 thought she would hate her Dartmouth experience. She is an international student from Turkey, and she said her high school was incredibly competitive. 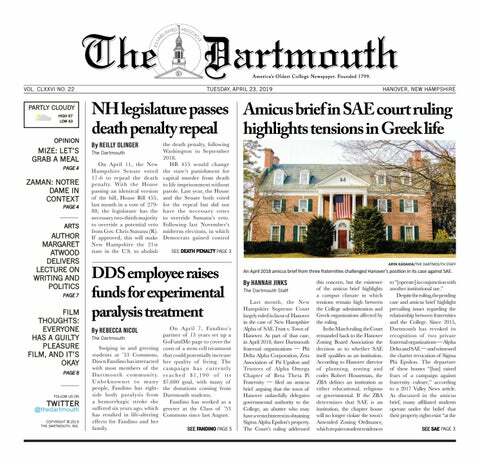 Even though Dartmouth is in the Ivy League, she noted that it is not viewed as highly internationally. It wasn’t just Dartmouth’s lack of name recognition that gave Dal doubt. Even after she arrived, Dal thought this wasn’t the place for her. But the day classes started, everything changed. Dal said she started to love Dartmouth and all of the activities she was getting involved in. As the newly accepted ’23s prepare to arrive on campus, current students offer advice for their expectations and plans. Dal specifically addressed international students who might have a skewed perception of Dartmouth. Locke stressed the importance of not always being a go-getter. “If you have the same sort of intensity that I do in terms of feeling like you need to do things, make sure to rest,” she said. Brody was told by everyone to “try things,” but there’s more to it than that. These students differed in how and how much they planned, but what they had in common was that their plans changed. My goals help me stay hopeful and keep looking forward, but they wouldn’t be helpful if they didn’t change to match my constantly shifting life.